Over the last 15 years or so, I’ve seen my fair share of cause-related marketing, but I don’t remember ever seeing any featuring lighters. 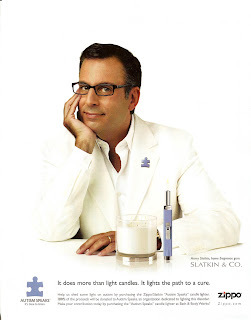 So, I was fascinated to come across this campaign from Zippo, candle designer Harry Slatkin, and retailer Bath & Body Works, benefiting Autism Speaks, the 3½ year old autism advocacy organization founded by Suzanne and Bob Wright. So I went to the websites of all the entities named in the ad, which appeared in the October 2008 Elle Decor to learn more. And what did I learn? I learned that nobody seems to want to own this campaign. Zippo.com has zip about it. Bathandbodyworks.com has a Slatkin lighter, but there’s zilch there about Autism Speaks. And there’s zero at AutismSpeaks.org, too. Could be there’s something in-store, but the closest Bath & Body Works to me is farther than I care to drive. I hate to be such a noodge, but if you can get your cause marketing campaign in a national magazine, you should also be able to have details about it somewhere else; a press release, a statement, a paragraph about it on the website that’s listed in the ad (more to the point, 3 websites). But not in this case. And there’s no one to point at besides Autism Speaks. Whether Autism Speaks initiated this campaign or someone else did, the buck stops with the benefiting charity. I appreciate that Autism Speaks is growing very fast, powered no doubt, by Bob Wright’s corporate muscle. He was the chairman of NBC Universal until May 2007. And, hey, stuff slips through the cracks when you’re growing fast. But growth is a reason for this trip up, not an excuse. Wright is still vice-chairman at GE, NBC Universal’s parent and if any charity executive should understand that he should. I’m in the top ten of the world’s biggest fans of cause marketing (number 4, to be exact), but even I would never equate buying a product with making a contribution to a cause. All the more so since we don’t know what that contribution is. All in all, I'm sad to say, a rookie effort from Autism Speaks and its sponsors. A great guidance and research. A boon to the lovers of marketing. Actually, if you read the tet at the bottom of the ad, it says 100% of the proceeds will benefit autism speaks -- so essentially, if you know that when purchasing it, you are intentionally making a contribution. you would be choosing the one zippo lighter from bath and body works that benefits the charity, instead if the other zippo lighters. and sometimes ads come out before a product is actually available -- sort of like movie trailers. i think all of the organizations/companies are still ok in this matter, as long as the lighter does surface soon. I have been waiting to buy a bunch of these lighters as holiday gifts. My daughter has autism, and I'd like to get it for her therapists et al. Bath and Body Works told me when I called today that they are already all sold out! Does anyone know what's up? I have been diliently checking the B&BW website for weeks, and they have never appeared. This blog has just been brought to my attention. I personally designed the Zippo lighter to benefit Autism Speaks and our stores carried it - all 1600 stores Bath and Body Works. The lighters sold out in most stores so fast and we were not able to reorder for the holiday period. We did however send a check for $100,000 to Autism Speaks for the 10,000 lighters we brought into stores.....I hope to continue this project in the future. My wife and I sit on the board of Autism Speaks and we started the New York Center for Autism (NYCA) the first charter school for Autism in the state of New York. We have a 9 year old child with Autism. I am so sorry that so many people were not able to get the lighters but thank each and everyone of those that travelled to our stores. I came here after poking about on the web searching for "cause marketing" for a blog entry and suspected it'd only be a matter of time before I stumbled across a mention of Autism "Speaks". I have one message for you and your readers. Be very cautious of the organizations with whom you are considering aligning yourself because many may find your selection offensive. Autism "speaks" is one such organization being widely reviled and controversial. I make a point to boycott any companies supporting it. One good litmus test is, do the "victims" of the disorder or disease, support the organization? Autism "speaks" fails that test by huge margins. I can't think of a single autistic person who supports the group. There are certainly *parents* who have been misled to believe their children have autism due to vaccines who support it but no one else in the established medical community. Their very name is offensive; Autism "speaks" doesn't even have a single member on their board with autism. How can they speak for autistics when they don't even include them? Their claim is that autistics are so disfunctional they are incapable of speaking for themselves. This is beyond patently offensive. Try telling that to Nobel Prize winner Vernon Smith (econ), Steven Spielberg, Daryl Hannah or any other number of famous autistic people. Summary: Your choice of a cause can actually create a bad image for your brand where none existed.